Since 2016 is our 50th anniversary year and we’ll be celebrating all year long in different ways. February was a throwback to your favorite t-shirts from the years past (and present! ), thank you to everyone who participated. We loved sharing in your memories and stories behind your February Favorite, and we hope you had fun too! 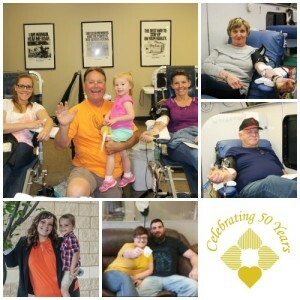 For the month of March, we’re asking you to help inspire your family and friends to donate blood! Maybe you have a sister or son, or even grandson (at least 16 years old) who could become part of our next generation of blood donors. Talk to them about why you do it and how it makes you feel to help others. Then bring them with you the next time you come in to donate and show them what saving lives is all about! One of the top reasons people give for having never donated blood is that no one ever asked them. So ask … you might be surprised at the people in your life who just needed the nudge. As you now know, the Community Blood Bank is participating in the Highmark Walk for a Health Community this June. This walk will allow us to raise money which will be put towards the purchase of a second bloodmobile. This second bloodmobile (a friend for Gus, our current bloodmobile) will allow us to better serve our donors by giving us the ability to hold more mobile drives than what our current resources allow. Have a jewelry lover in your life? Participate in the blood bank’s fundraiser with Park Lane jewelry! To shop our fundraiser, visit this link. We’ll be hosting other fundraisers with other organizations throughout the next few months, keep an eye on your email for details! If you’ve visited our website or if you follow us on social media you’ve seen us talking about the importance of opting in to receive text messages from CBB. These messages aren’t just about promotions, they’re about helping patients when time is precious. If you still haven’t opted in to receive text messages, please text the word BLOOD to 444999. Our ability to reach you quickly could make a world of difference for a donor in need. According to MobileSquared, over 90% of text messages are read in three minutes, compared with just 22% of e-mails in that same time frame. When viewing your Donation History through your portal, please be aware that the number shown is what you want to go by. The detailed history which includes dates and donation information will show every visit, including those in which you were deferred. The number listed next to Donation History counts only your successful donations. Yes, we are still counting your gallons! Your gallon achievements will still be calculated for our annual donor dinner, these milestone achievements are an additional way of recognizing you for your dedication! Your donations (milestones) are recognized in increments of 10 up to 100, then in increments of 50 from 150-450 donations. Once you have reached a milestone we will mail you your cling, please allow up to two weeks for delivery. Thank you to our GR8 GIVERS group from this month: ZURN Industries! As a reminder, GR8 GIVERS takes place year round, and groups can consist of family, friends, co-workers, neighbors, classmates or members of your church. Once your group of 8 (although more are always welcome!) have signed in and donated during your selected week, you’ll automatically be entered into a drawing for a $100 gift card for breakfast or lunch for your group! Already have your group selected? Simply contact Deanna Renaud, Director of Donor Services for Community Blood Bank, at drenaud@fourhearts.org OR at (814) 456-4206 to reserve your week! Congratulations to Michael S., a Platelet donor, who won the $100 gift card in January! One winner is selected at random from the point store drawing each month, you can enter as many times as you’d like each month OR you can redeem your points for something tangible like a coffee mug, t-shirt, or gift card. Your points are yours to use as you’d like, happy shopping!